Have you ever seen the film Saw? You know, the one where that guy from The Princess Bride is locked in a murder basement by a deranged serial killer? Have you ever thought to yourself, “You know what? This movie would make a great Bomberman clone!” Bloober Team tried to make that concept a reality with Basement Crawl, but unfortunately, what we ended up with was a broken game--in more ways than one. There’s no real narrative to speak of here, though the intro cutscene tries to set the tone for the entire game. A young girl speaks to her grandmother, wondering what the outside world is like. Grandma explains how it’s dangerous outside, she’ll be safe here, everything will be fine--as images of a rusty, dilapidated cellar flash on-screen. And then we see the grandmother lying dead on the ground, surrounded by a bunch of creepy toys--the very toys you control in the game. This decidedly disturbing scene fails to provide any sort of context for why these toys are partaking in online Bomberman-esque matches. Are we fighting over who gets to murder the little girl? Are we trying to save her? Does it even matter? It’s best not to think too much about the morbidly unpleasant vibes and just start playing some multiplayer. If, that is, you can even get the game to work. Basement Crawl’s netcode is so broken you’ll likely spend more time trying to get into a match than actually playing. I’ve spent tens of minutes entering and backing out of blank lobby screens, the word “Waiting…” slowly printing itself out ad nauseum before I ever saw combat. And when matches actually do work, rounds frequently start without any of the characters showing up on-screen, leaving you to wait for the timer to slowly tick down to the end of the match. The game even locked up on me once as I was trying to exit one of the many blank lobbies, forcing a complete restart. In today’s day and age, when so many different options for video games are available to us at the press of a button, it’s inexcusable to release a game this broken--and yet, here we are. When you finally get to play an actual, working game of Basement Crawl, you’re greeted with one of the most confusing, twitchy, and poorly designed bastardizations of the Bomberman formula since Bomberman: Act Zero. You choose one of four characters to control on an isometric grid--matches can hold up to eight players, and duplicates don’t have alternate color schemes, so you will inevitably confuse your own character with everyone else’s. This, along with a poorly worded and vastly uninformative instruction manual, leaves you with little clue as to what you’re actually supposed to do in a given match. Even if you’ve played games like Bomberman before, trial and error is the only way to figure things out. Following Basement Crawl's release, Bloober Team issued an open letter to its community, stating it will be addressing the game's bugs. "In our pre-release testing and QA process, we didn't encounter these issues," the developer said. "They emerged only after the game went public. Had we known about these issues, we would have delayed the release further until all known bugs were fixed." Time will tell whether or not this patch arrives--and how effective it will be addressing the game's underlying problems. But until then, you'd be wise to avoid this game. Your goal is to place traps on the grid-like map in such a way that you lure your opponents into their blast radius, picking up power-ups along the way to make your character stronger. It’s a tried and true design, but the reason Bomberman works is because of its specifically methodical pace--yes, you need to be quick on your feet, but you also need to think at least one move ahead. Basement Crawl, on the other hand, moves too fast; its UI elements are muddled and unclear, and its power-ups are indistinguishable from everything else on the map. It’s less about tense cat-and-mouse maneuvering, and more about littering the ground with as many explosives as you can and then hoping for the best. And when all of your stats are halved each time you die, future deaths come swiftly and frequently--so it’s best to just go in guns blazing, rather than actually think about what you’re doing. From the confusing UI and instructions, to the needlessly off-putting aesthetics, to the fact that the game just doesn’t work much of the time, Basement Crawl is uninviting to all but the most masochistic and desperate of players. Can a game in this genre exist in the 21st century? Sure--but this one isn’t worth your time. 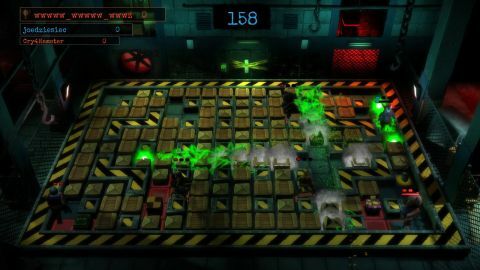 A poorly executed Bomberman clone that is technically broken in almost every respect, Basement Crawl is shambling husk of an online multiplayer game. Avoid as if your life depended on it. This game was reviewed on PS4. Description Collect power-ups then blow up your enemies in this Bomberman style multiplayer game.